Last night was very cold. We both used one of the 10 hot patches which I brought from Japan. They are about the size of a postcard and once out of the packet they quickly warm up and stay that way for about 12 hours. God knows where Narayan slept but he was his normal smiling self in the morning. Peter slept on the floor but said he was OK. We were among the last to leave again, this time at 8:15. Peter and his porter walked with us for the first 20 minutes but it was obvious they could walk much faster and they took off. 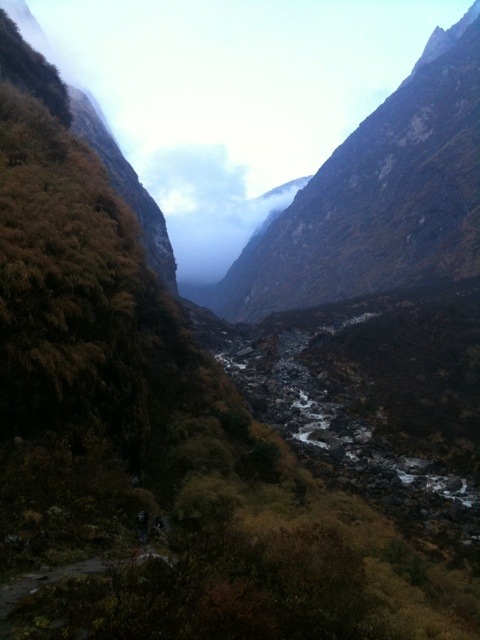 The route today was very slippery; it rained heavily in the night. There weren’t too many rock steps just a relentless uphill slope. At times we had to cross rickety bridges over tributary streams but Julian can do these now without hesitation. At one point a porter came struggling past with a basket on his back from which we could see legs protruding. It was a small, old Japanese man who was being carried down. He looked pretty cheerful and we wished him well in Japanese which made him smile more and he waved to us. Not sure what the problem was but it shows how strong these porters are. The path went higher and higher curving round the valley. The path and the Modi Khola river and getting closer and closer. About 3 o’clock we reached the Hinku Cave. It’s under a huge over hanging rock and we believe it is where the Yeti sleeps. There was a cylinder of Pringles, some burnt firewood, a few cigarettes and the names of people scratched on the roof of the cave. Perhaps these are names of his victims! We are on his scent now. Finally at 4pm we arrived at Deurali. Peter was waiting for us with a chocolate bar which was very welcome. Just after we arrived it started raining. We had mad it just in time. This is all the luggage we took. 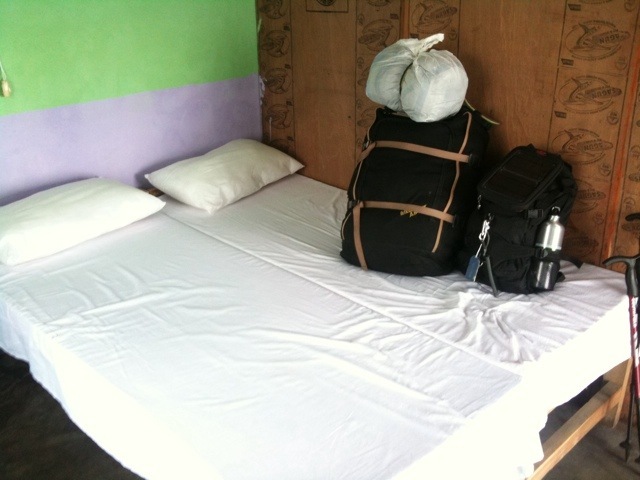 Narayan carried the large rucksack with a sleeping bag tied on top. I carried the smaller rucksack. Hey there Andy and Julian!! Looks like you guys have been having quite the adventure! Everyone here is really proud of you guys! Keep it up and stay warm! Its getting cold here too, we had a really big rain strom the other day, it was really windy! Looking forward to seeing more photos! Sachio had a great time in Peru and Yuji ate dog while he was in China!! As always travel safe!